WR 16 is a Wolf-Rayet star (HD 86161) ~7,500 light years distant in the southern constellation of Carina that is surrounded by a perfectly circular bubble about 8’ in apparent diameter. Charles Wolf and Georges Rayet discovered what is now known as Wolf-Rayet stars in 1867, but it took over 50 years to discover that the gases ejected from these massive stars were traveling at high velocities, ranging from 300-2400 km/s, interacting with and carving out the interstellar medium, often producing a wind-blown nebular bubble. The bubble is ionized from the ultraviolet radiation of the hot WR star and glows based upon its elemental makeup. That makes these objects ideal targets for narrowband filters, which bring out structural details and faint nebulosity. Eventually, these WR stars will likely end up in supernova explosions. The bubble around WR 16 was discovered by Marston et al. in 1994 (ApJS, 95, 121, 1994). In the image above, north is up and east is to the left. The circular bubble near the center is brighter toward the NW and appears to fade into the surrounding nebulosity toward the SE. 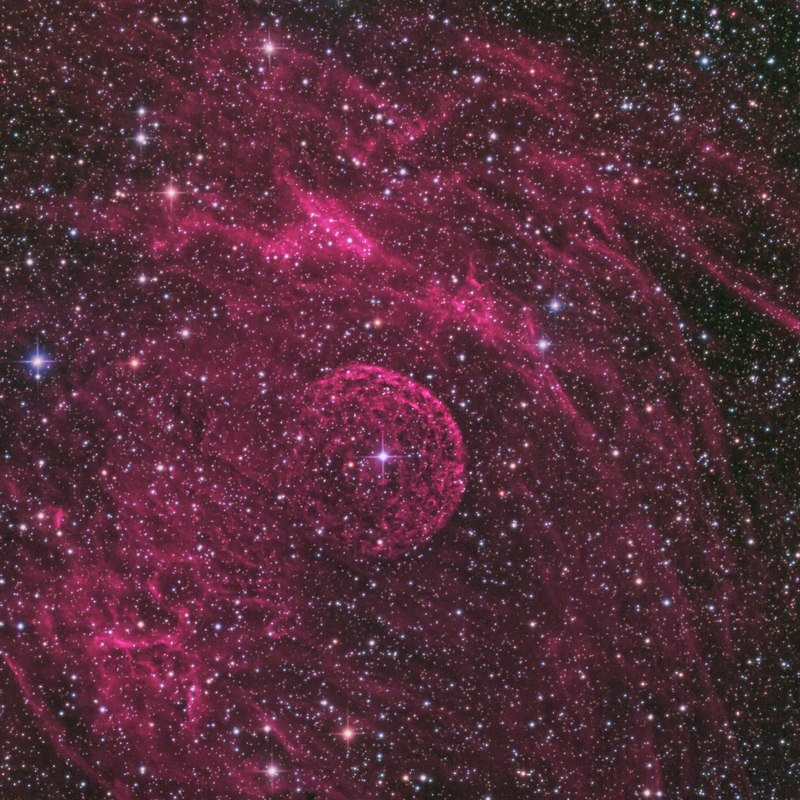 Similar to the Crescent Nebula (NGC 6888, another WR nebula), the surface of the WR16 bubble is pock-marked, resembling the pit of a fruit. Test exposures of the bubble showed no significant emission from oxygen (OIII) and sulfur (SII) consistent with Marston et al. (AJ, 518 769—777, 1999), so the nebular color in this image comes from hydrogen emission using our 5 nm hydrogen-alpha (H-a) filter. The nebulosity surrounding the bubble is thought to come from earlier ejection events of WR16. This image was made with 4 hours of 10 minute exposures using red, green and blue (RGB) filters. 7.5 hours of 5 nm H-a 30 min exposures were blended approximately 75:25 into the red and blue data to simulate H-a (red) and H-b (blue) emissions, respectively. Star colors are based upon a G2V calibration. To the best of my knowledge this is the first color image of the nebular regions surrounding WR16.